Merlin has some hearing loss. Both ears are pretty much effected equally. We don't know the degree of hearing loss yet (more on this later) and we probably won't know for about another 4 months or so. also indicated that there was partial damage to the hair cells in the cochlea [inner ear]. Another test confirmed this, but again we don't know the extent of the problem. Basically, we have to wait for 2 things. First his hearing has to finish developing, and second he has to be old enough to actively participate in tests to indicate what he can hear. They have quite sophisticated ways of getting information from babies about 6-8 mos. old (corrected age, of course). We will begin the process to get hearing aids to exploit whatever hearing development (and speech) we can. He has to see an ear,nose and throat Dr. first, and if all goes well, he'll have aids in about 6 weeks. If necessary, he could be a candidate for cochlear implants down the line. We will also start pursuing early intervention programs. There are a couple of different philosophies as to what is the best approach. Well it was a busy and happy holiday season. I was curious to see how Merlin would stand up to all the visitors - I guess I shouldn't be surprised that he was still the life of the party long after his parents were flopped out on the couch. Just give that boy 10 minutes of shut-eye and he's ready to snuggle and play for another 2 hours more. Those of you visiting the website regularly will see that we haven't got any holiday photos up yet. (Those that have digital copies should send them to Grandpa Kit for posting on the site). The big news is of course Merlin's debut as a cover boy (see the website). We have many appointments for the end of January, including the plastic surgeon and a hearing test. Merlin's over-all health is good. But he didn't gain enough weight the end of December (he's not quite ready for turkey dinners yet) and so he is back on the oxygen during the days. Not so much because he has breathing problems, more to boost his metabolism so he eats more. This strategy is working. He weighed in today at 4.73 kg (10 lbs 7 oz), which is a significant gain from his last weigh in. Oh, I almost forgot to say - he rolls over now. Both from front to back and back to front. It's about a once-a-day occurrence now, so we have to start babyproofing the house now. Merlin is a cover boy! A prestigious British medical journal has used one of the earliest pictures of Merlin on the cover of their January edition. Here's the link to show our boy on the cover of the January issue of ADC Fetal and Neonatal. Click on the Cover illustration link to see the photo larger. above 90%. The final test that all was well, was a weigh-in at the Doctor's office. He is now 4.2 kg (9 lbs 5 oz). This keeps him on his growth curve. Now Mom, Dad and baby all breathe easier. Apart from meaning Merlin is getting healthy and strong, it makes life a lot easier around the house and for going out and about. And just in time for holiday festivities, too. Merlin would also like to welcome (somewhat belatedly) his new second cousins: Zoe, born September 13 in Ontario and Olivia and Lucas born November 22 in Oregon. Coincidentally, all of whom were a little earlyish and smallish (but significantly bigger than Merlin). We all look forward to meeting these cousins before too long. Expect to see lots of great photos with great grandparents and great aunts and uncles after the holidays. It's going to be a big family celebration! Merlin is growing and doing well (over 8 lbs now). I'm trying to get him to breast feed more. Monday we are going to try taking him off the oxygen again. improvement of vision was low, and the risks of making the situation worse was too significant to make it worth while. So right now, he visits his peadiatrician every 2 weeks, the opthomalogist every 3 weeks. The health nurse comes by to weigh him every few weeks, and Infant Development come by every month. Still waiting on an appointment with a plastic surgeon to see about his nose. Anyhow, we're pretty busy and with one thing and another, we get out pretty frequently. Last weekend we went on our first official non-medical outing out to Langley to see great Nana and Papa. Fun was had by all. on the regulator. He perked up again as soon as he got that little bit of extra oxygen. He's eating lots, he must be gaining weight. We'll find out how he's doing at next week's Dr's appointment. Other than that, things are going okay. We're settling into the groove and enjoying this beautiful fall weather. Yesterday, Merlin went on his second outing to see his paediatrician. Grandma Leslie helps me with all his gear - the usual baby stuff plus the oxygen tank. He weighed in at 3120 g (6 lbs. 14 oz.). Then we went across the street back to the familiar Special Care Nursery to see our fans... I mean to get hooked up to a pulse oximeter. This meter reads the oxygen content in Merlin's blood. A handy thing, if you are thinking of turning off the extra oxygen flow. After 2 hours on room air only, with good meter numbers, the good Dr. said we could go home without the tank hooked up. We stayed for another hour just to be sure. So now Merlin is like a regular newborn, truly breathing on his own. After 36 hours or so, we can honestly say it has had absolutely no ill effects, he is just as wiggly and energetic as ever. Grandpa Kit writing here... Merlin is home! (Typing these words has brought tears). On Friday Merlin moved from Royal Columbian into his first true home with Rob and Gilly. 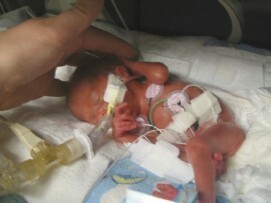 He is the first premature baby that RC has ever sent home on oxygen therapy. Gilly said that that last few days have been quite crazy with technicians checking out and setting up the gear. Lots of visits with hospital teams and advisors too. After a very active first night, Merlin is now settled in pretty well. The current stats are: weight 3045 g (just over 6 lb 11 oz) and an incredible 49.3 cm long (tall?). Gilly and Rob are still working out the logistics of it all. Gilly said that she was feeling quite well-prepared ahead of the big move but has since realised that there were lots of things left to do. Grandma Leslie is with them and helping out. Will add some pictures when we visit Gilly, Rob and Merlin later today. But wait, that's not all... today his doctor came in and turned off the oxygen. They do this little test every now and again to see how it goes. Today it went pretty well. His oxygen saturation dropped (mid 80's), but it didn't plummet. So it only got turned back up to about 12 cc's. (about half what it was previously). I left Grandma Leslie watching the situation. It remains to be seen if this will tire him out too much, but even if it needs to be turned back up again, this was a big jump for him. He weighed in yesterday at 2770 g (6 lbs. 2 oz.) - almost what Mommy was when she was born. Merlin had a few visitors today (Great Aunt Deb, Aunt Jess, Uncle Jonas) Jess also took a few pics, so there are likely more to follow. He's 2470 g today. Taking all his feeds by bottle. His oxygen was turned very low during the day, and up a bit this evening. He is doing very well. Once he is off oxygen, they will make sure he isn't getting too tired for a couple of days, make sure he is still gaining weight and taking bottles, etc... and then it will be time. Merlin weighed in at 1930 g (4 pounds 4 ounces) tonight. His oxygen is at 25%. Those of you hitting the website regularly have probably already seen the video of Merlin suckling (I don't think it is windows compatible at this point.) He is still getting his milk through a tube or bottle, but he has had a few practice sessions at the breast. When he doesn't need any extra oxygen, we'll try breast feeding for real. Yesterday, the nurse held up an outfit to him, to see if it would fit and it was too small. It's nice to know that some manufacturer somewhere makes premie clothes that are too small for our boy! in at 1810 g (4 pounds!) last night. His oxygen requirement is at 32%. They've found that it is best to wean the oxygen very slowly for him, so it's going to take some time. All we are waiting for at this point, is for the oxygen to come down to 21% (room air) and for him to take all his feeds by bottle. Grandma Leslie took some really cute pics of Rob giving him a bottle (he ate the whole thing), so look for them. that) should be about a month away. He weighed in at 1440 today. They'd like him to be gaining a bit more, so they've upped his feeds to 19 ml. He had an eye exam and a head ultrasound this week. Both came back good. He will have a few more eye exams to make sure they are developing properly, but it seems the danger of brain bleeds is over, so no more head scans. Last night they were able to reduce his oxygen a bit and they have taken him off the caffeine. So he is doing very well. Grandpa Kit took some photos of us having a snuggle with his oxygen mask on. And some of him without any gear at all. So you can really see his face. They're on the website now. So at 1400 grams, Merlin has more than doubled his birth weight. He is a little "puffy" today, so some of that weight is water retention, but there is no doubt that the boy is growing. He now gets 17 ml of breast milk every 2 hours. But the big news is that the CPAP is off. As of about 11:30 this morning, he is breathing on his own with oxygen pumped into his incubator. Hopefully he can continue on this way and they can wean him off the oxygen. He looks very pleased and content to have all the breathing gear off his face. His new trick is pulling at his feeding tube (he likes to keep the nurses on their toes.) So, once the breathing situation is well in hand, I guess getting him onto the bottle/breast will be next. This morning at 11:30, Merlin was extubated and put on the much anticipated CPAP mask. He's been on it now for 4 hours and his nurse says she's "very pleased with him". He looks much more comfortable and was very alert when we saw him. He smiles when Rob sings "Kung Fu Fighting" to him. He also gained weight and at 1330g he has very nearly doubled his birth weight. We are both very proud of him. Well, as ever, an eventful week. Finding the equipment Merlin needed was proving quite difficult. Although his great uncle Rob and aunt Lyn really scored finding the gear in TO, getting training for his caregivers on it was also going to be difficult logistically. However, it turns out there are a couple of other hospitals in the lowermainland that could offer Merlin the level of care he needs. Royal Columbian (New Westminster) has a CPAP mask and flow driver unit and staff that are already familiar with using it. So the upshot of all this is that Rob and Merlin went on an ambulance ride on Saturday from Children's to Royal Columbian Hospital. He's all settled in his new place. It's a smaller nursery, so it's a little quieter too, which suits Merlin well [although he's going to miss his favourite nurse ;) ]. So now it's back to weaning down the ventilator settings until he is doing most of the work and then trying him on the CPAP. His weight yesterday was 1226 grams (just over 2.5 pounds?). We had a snuggle this morning and he grabbed my thumb hard. He's doing well. They've reduced all his settings on the ventilator to the point where he is doing most of the work. They are looking for a special CPAP (continuous positive airway pressuree) mask to put him on. (This is a mask form of the prongs that hurt his nose) He'll be taken off the ventilator when they find one, or when he just gets big enough to go without the CPAP, whatever happens first. He is consuming milk only, so no more IV. The only tubes he has now are his breathing tube and his feeding tube, so he's a little more comfortable than he was. The cuddles continue and I'm really starting to see his personality develop. Yesterday he met his great uncle David and great aunt Barb. and feed us. We are largely unpacked and settled in record time. grow very quickly soon as he moves on to real milk. means a lot to have such a cheering squad. which they need to do about weekly because they take so much for testing). Yep, our boy is officially 1000 grams on the nose yesterday. snuggle, if his oxygen needs stay in the low 40's or better. to have cleared that up. lungs, which they are going to give him diuretics to try to correct. The main thing is he needs to mature his lungs and grow generally. 970 g but some of that is probably water weight. he is so small to begin with. (if you know what I mean). His brain scan was good. own for a bit, gets tired, and then goes on it again for a while.